Bad breath, also known medically as halitosis, is one health problem that many people dread having. Although you were taught the few basic steps on how to clean your mouth to prevent bad breath since childhood, there are still many factors that can lead to the development of such a condition. For you to be equipped enough to fight off bad breath, you need to understand the different factors that may cause this. It’s especially important for adults with braces as this could only make the condition worse. Poor Oral Hygiene. Sometimes, when you are brushing your teeth, you fail to clean them thoroughly because of improper brush stores or by completely disregarding hard to reach areas around the teeth. Thus, tiny particles of food are not completely eliminated causing bacterial build-up in the mouth. These bacteria then release a substance that is the cause of the foul-smelling breath. Braces. Aside from poor dental hygiene, dental braces can lead to the development of halitosis, too. The stuff braces are made of tend to cover the teeth surface, making tooth brushing less effective. Thus, this allows more bacteria to feast on the abundant food particles that are left behind after brushing. Food. It is probably known to many of us that certain foods, such as onion, garlic and cheese, can cause bad breath. Despite its nutritive value and benefits to the body, if these foods remain lodge on the teeth and mouth, its components can really live a foul-smelling odor. Have Tools For Dental Hygiene. It is not just important to brush your teeth but to brush long enough giving you ample time to reach all teeth areas. Aside from brushing just your teeth after every meal, don’t forget to clean your tongue by using a tongue cleaner or tongue scraper to remove food particles and bacteria from the surface. Tongue cleaners have become just as essential as toothbrushes. Learn to use floss as well to clean in between the teeth and gums. With all these essentials for oral care and using it properly can prevent bacteria build up, and in effect prevent bad breath as well. Drink Water. Water helps in neutralizing the effect of certain food ingredients in your body system and it hydrates your mouth, too, which also helps prevent the formation of odor-causing bacteria. Clean Mouth Naturally. Juicy fruits, such as apples, can also help put out your bad breath, and so can chewing a few leaves of parsley or spearmint or some other good smelling herbs. Once you decide to get braces to correct teeth imperfections, you should be ready to face the responsibilities of having to pay enough attention in terms of performing oral hygiene. Otherwise, this will only cause more imperfections and consequences. So if you do clean your mouth religiously prior to getting braces, that means you have to double your efforts once the braces are on. Adults with braces have the tendency to suffer more from halitosis because of carelessness in committing to a proper oral hygiene. 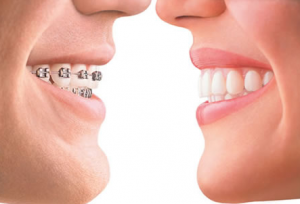 Adults with braces may also have the tendency to wear the braces longer, as the progress of the treatment is slow. This means that the longer the braces are worn, the higher risk for bacterial build-up happens in the mouth. If you happen to be stuck with dental braces, don’t worry because all you need to do is give yourself extra time in cleaning your teeth using all the mouth / tooth essentials. You can also ask your dentist for special floss for you to be able to floss easily with your braces on. Rinsing your mouth with a good mouthwash will also help kill some remaining bacteria. Wearing braces take work and it does take effort to care for the teeth when these are on. But doing so will only benefit you and your oral health. It takes time, patience and commitment, but the efforts you invest on this should be all worth it. Visit BracesCostInfo.com for tips and guides in relation to braces care and management. 4 Valuable Tips For The Healthiest Smile Possible For Your Family!